After attending Luther College in Decorah, Iowa, I worked in St. Paul, Minnesota at a production pottery, and traveled around the Midwest, United States working for a variety of studio potters. I enjoy travel, and visiting a variety of cities, but I've been more comfortable living in the rural areas. My first studio was located in the beautiful Canoe Creek valley, north of Decorah. 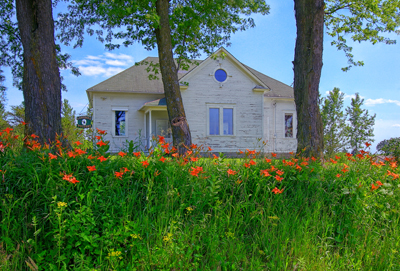 I had rented an abandon farm house, overlooking 800 acres, including the trout waters of the Canoe Creek. After 3 beautiful years, living, working, and playing at this location, the landlord passed away unexpectedly, the land was sold, and I needed to move. One morning on a trip to Burr Oak (also north of Decorah), for some pizza from the Burr Oak Mercantile, I drove past this odd looking boarded up building that was being used as a barn. After a brief inquiry about the building, I had found my new shop. It was an old public school building. 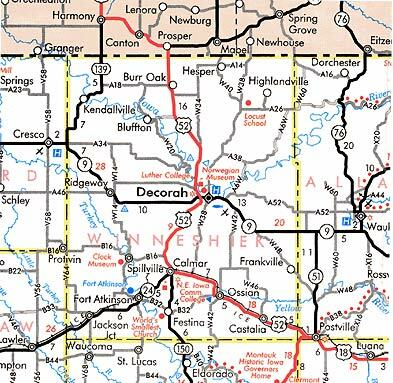 Burr Oak is located 12 miles North of Decorah, Iowa on U.S. highway 52. It's one of those towns that was previously divided by the highway, until the highway was straightened and moved, for more efficient travel and safety. It is the home to the Laura Ingalls Wilder Park and Museum. Also, there are two active churches, the Burr Oak Mercantile, Country Express gas station, and a bar. The cemetery, however, has the largest regular attendance. 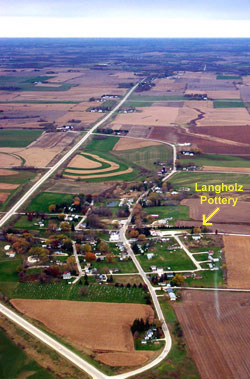 The school building in which the pottery is located, served the area until the early 1960's, at which time consolidation of Iowa schools took place, and North Winneshiek school district was established. 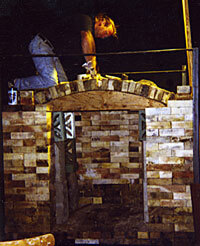 After collecting used bricks from Albert Lea, What Cheer, St. Paul, and Decorah, Minneapolis production potter and performance artist, Jimmy Jahoda, kindly came and supervised the construction of a 50 cubic ft., propane fired, downdraft kiln. Recently salt and soda ash have been introduced into this kiln. This technique is of Medieval European origin, where salt or soda ash is introduced into the kiln at around 2300°F. 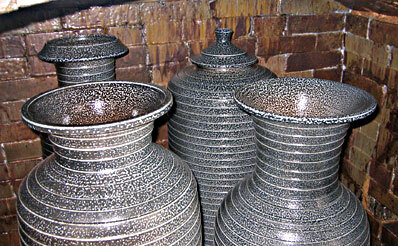 The sodium combines with the vitrified clay to form glaze, with colors from the natural clay or colored clay slips, and produces unusual glaze effects.